Ofcom today published data on the volume of consumer complaints made to Ofcom against the major providers of telecoms and pay TV services. The latest report covers the three-month period from April to June 2015 (Q2), and includes complaints made about 13 providers of fixed line telephone, fixed line broadband, pay monthly mobile and pay TV services. 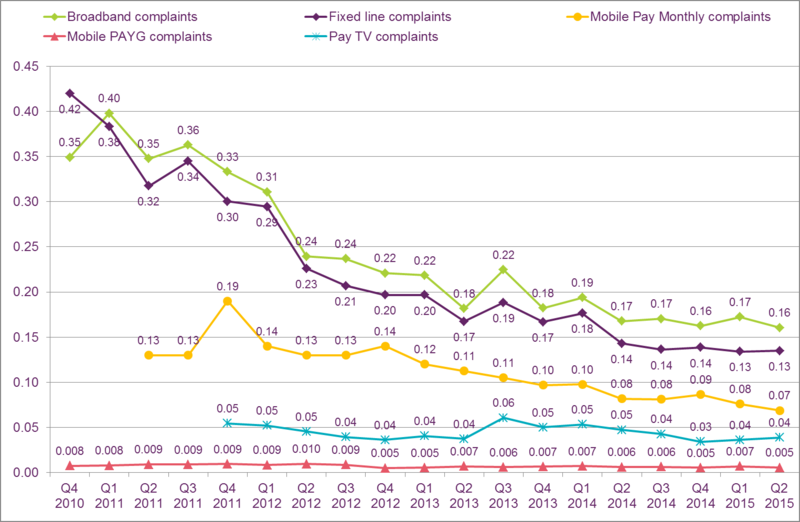 This is the eighteenth quarterly Ofcom report to include complaints data by provider, and the fourteenth report to include data for pay TV complaints. Consumer information plays an important role in ensuring competitive communications markets work for consumers. By publishing complaints data, Ofcom aims to give people who are looking for a new provider useful information for comparing companies’ performance. The quarterly reports also offer an incentive to providers to improve their performance. The total volume of telecoms and pay TV complaints made to Ofcom continued to decrease in Q2 2015, even as the number of consumers taking up these services increased. Broadband, mobile pay-as-you-go and mobile pay monthly services saw the most notable reductions in total volume of complaints. Total complaints volumes for fixed line telephone and pay TV services remained at similar levels to Q1 2015. Broadband services continued to attract the most complaints, albeit at lower levels than previously. Claudio Pollack, Director of Ofcom’s Content and Consumer Group, said: “Our complaints data allow consumers to make meaningful comparisons that can be useful when looking for a new provider. Despite seeing a reduction since Q1 2015, EE continued to generate the highest volume of landline complaints as a proportion of its customer base (0.34 per 1,000 customers). The main complaint drivers for EE landline customers were problems changing provider (32%), concerns about faults, service and provision (29%) and complaints handling (17%). Post Office HomePhone, Plusnet and TalkTalk also generated landline complaint volumes above the industry average of 0.13 per 1,000 customers. BT was broadly in line with the industry average. 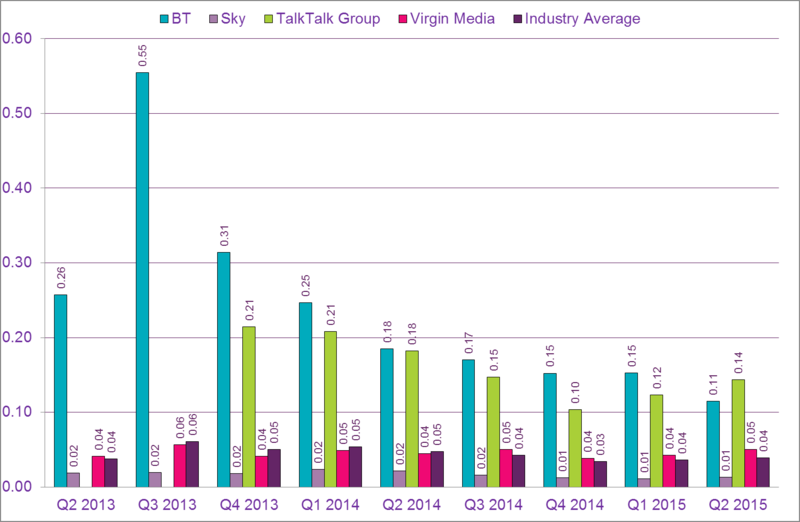 Sky (0.06 per 1,000 customers) and Virgin Media (0.07 per 1,000 customers) were the only providers with complaints volumes below the industry average. Sky continued to generate the lowest number of landline customer complaints. EE also generated the most complaints for broadband as a proportion of its customer base during the second quarter of this year. However, their complaints volume did decrease from 0.51 per 1,000 customers in Q1 2015 to 0.45 in Q2 2015. Problems relating to faults, service and provision (40%), billing, pricing and charges (20%) and complaints handling (20%) were the main drivers of complaints about EE broadband. 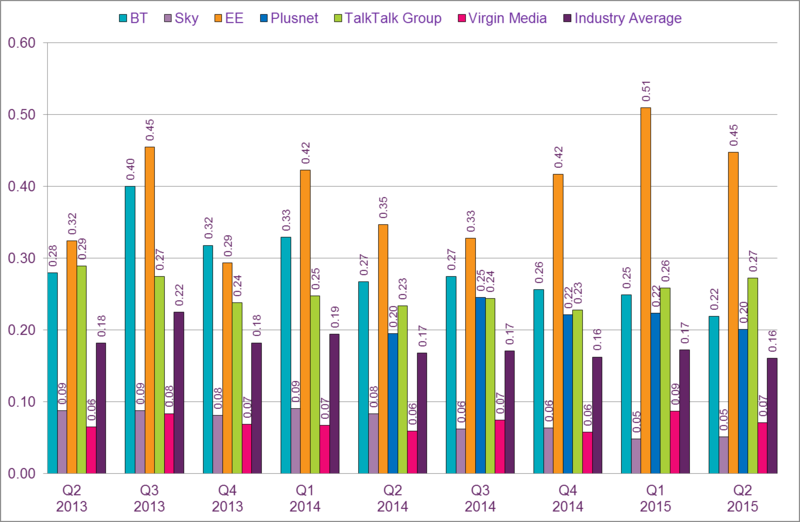 TalkTalk’s complaints volume (0.27 per 1,000 customers) increased from Q1 2015 and is above the industry average of 0.16 per 1,000 customers. While BT and Plusnet both saw reductions in their complaint volumes since Q1 2015, both providers continued to generate more than the industry average (0.22 and 0.20 per 1,000 customers respectively). Virgin Media complaints (0.07 per 1,000 customers) were below the industry average and have decreased since Q1 2015 (0.09 per 1,000 customers). Sky had the lowest complaints volume (0.05 per 1,000 customers) for broadband. Vodafone continued to be the most complained about mobile provider in Q2 2015 (0.14 complaints per 1,000 customers). The main drivers of Vodafone complaints were problems with billing, pricing and charges (34%), complaints handling (27%) and concerns around faults, service and provision (17%). Talk Mobile complaints increased to 0.12 per 1,000 customers and remained above the industry average. 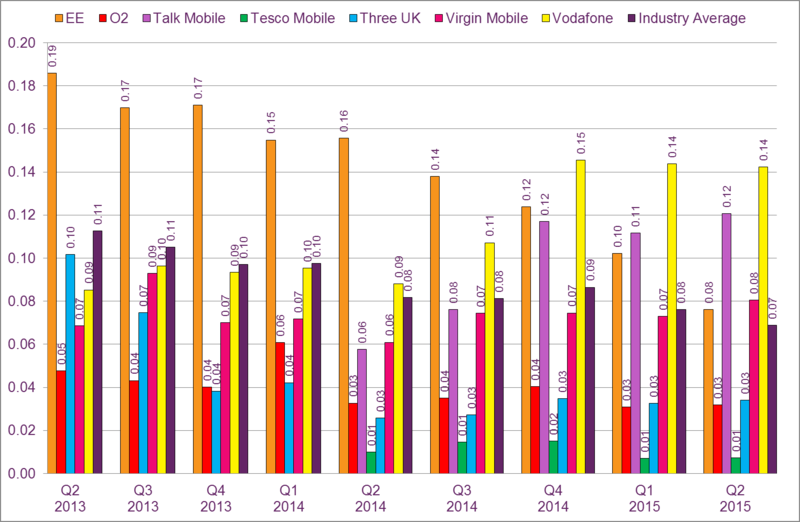 Complaints about Virgin Mobile also increased - to 0.08 per 1,000 customers in Q2 2015, up from 0.07 in Q1 2015. EE also generated more complaints than the industry average. O2, Tesco Mobile and Three UK all generated complaints volumes below the industry average of 0.07 per 1,000 customers. Tesco Mobile generated the lowest volume of complaints per 1,000 customers (0.01) for the fifth consecutive quarter. TalkTalk became the most complained about pay TV provider. Their complaints volume increased to 0.14 per 1,000 customers, compared to 0.12 in Q1 2015. The main reasons for TalkTalk complaints were fault, service and provision issues (36%), billing, pricing and charges (28%) and issues relating to complaints handling (17%). In Q2 2015, BT saw a reduction in complaint volumes, generating 0.11 complaints per 1,000 customers, compared to 0.15 in Q1 2015. 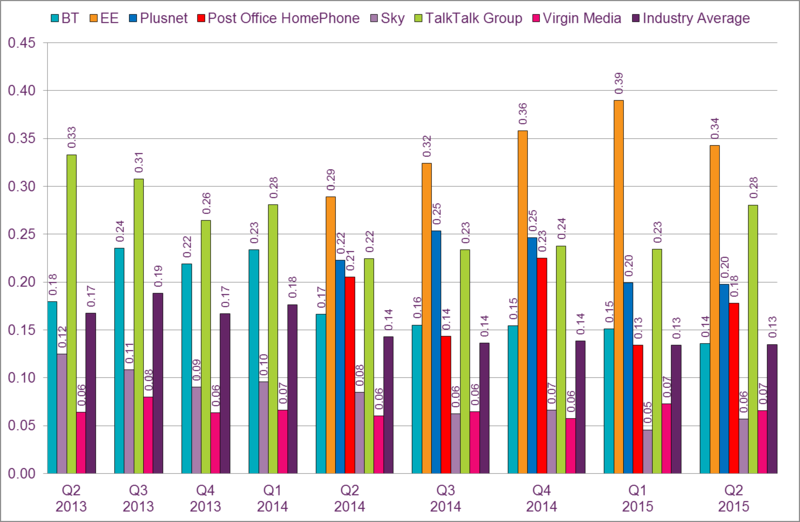 Virgin Media’s complaints volume increased to 0.05 per 1,000 customers, compared to 0.04 in in Q1 2015. The only provider to generate fewer complaints than the industry average was Sky (0.01 per 1,000 customers), which remained the best-performing pay TV provider. On average, Ofcom receives slightly fewer than 300 telecoms complaints a day from consumers. These individual contacts are analysed - alongside customer service satisfaction data and other sources of evidence - to help inform when and where additional consumer protection measures may be needed. Earlier this year, Ofcom extended an industry-wide monitoring and enforcement programme looking at providers’ compliance with requirements for complaints handling procedures. Evidence gathered as part of this monitoring programme led to Ofcom opening separate investigations into the complaints handling procedures of Three UK and EE. Ofcom fined Three UK £250,000, and in July this year EE was fined £1,000,000 by Ofcom for failing to comply with rules on handling customers’ complaints. An investigation into Vodafone’s complaints handling procedures - the third to take place under this programme - is currently ongoing. The criterion that Ofcom generally applies for inclusion in this report is that providers have a market share of 1.5% or above. Where we refer to providers’ relative positions, as best or worst providers for example, we mean of those providers included in the report. Similarly, ‘industry average' refers to the average of providers included in the report. Complaints about other smaller providers are not included in the report or the average. Consumers typically raise a complaint with their provider in the first instance. If the provider is not able to resolve the complaint within eight weeks, the consumer can submit their complaint for consideration by an Alternative Dispute Resolution (ADR) scheme under General Condition 14.5. In addition, some consumers contact Ofcom. While Ofcom does not resolve individual complaints, it offers advice on how best to resolve the issue and uses the data to inform policy and enforcement actions. To enable comparison, complaints are reported per 1,000 subscribers. Providers described as generating the most or fewest complaints therefore do so in relative terms, per 1,000 subscribers. Advice for consumers on how to complain about a provider can be found on Ofcom's website.